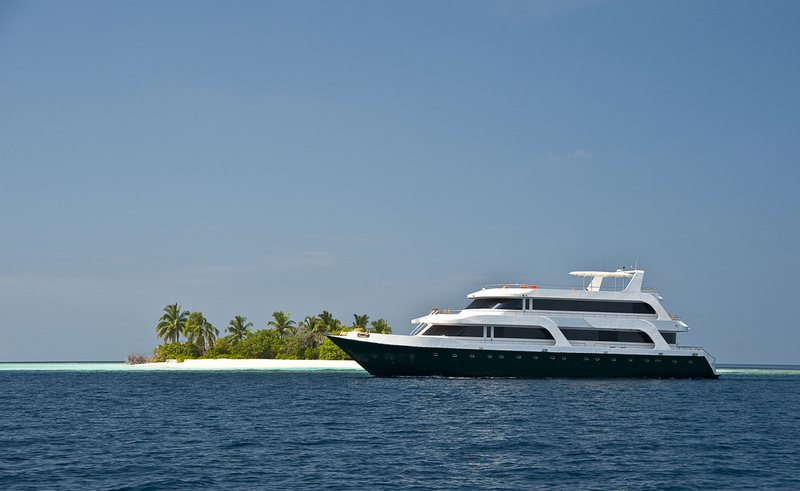 Motor Yacht LEO (ex ARK ROYAL) is a custom built 35m (115ft) dive yacht based in the Maldives year round. 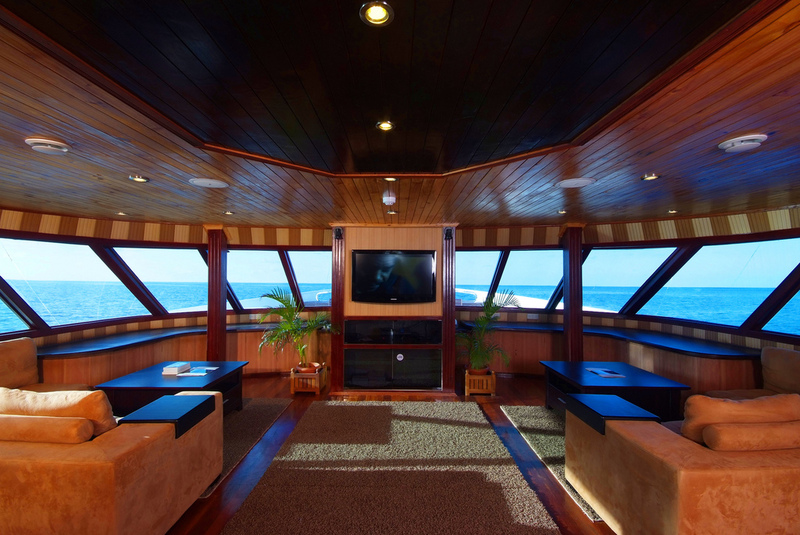 M/Y LEO offers up to 18 charter guests’ accommodation in 8 double and 8 twin cabins plus 1 suite. 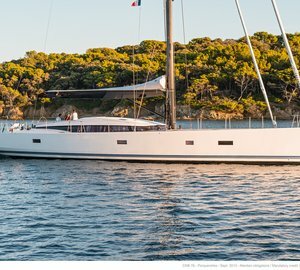 Charter dive yacht LEO has a bright and spacious interior featuring warm woods and large windows throughout. 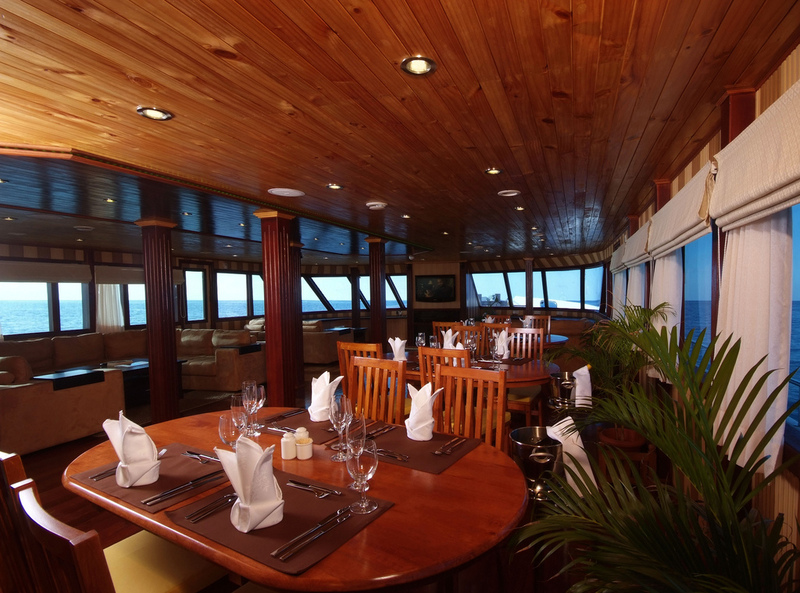 Yacht LEO has a large salon and dining area in an open plan. The salon lounge boasts neutral toned plush sofas on the port side and forward with a large flat screen TV and entertainment system. 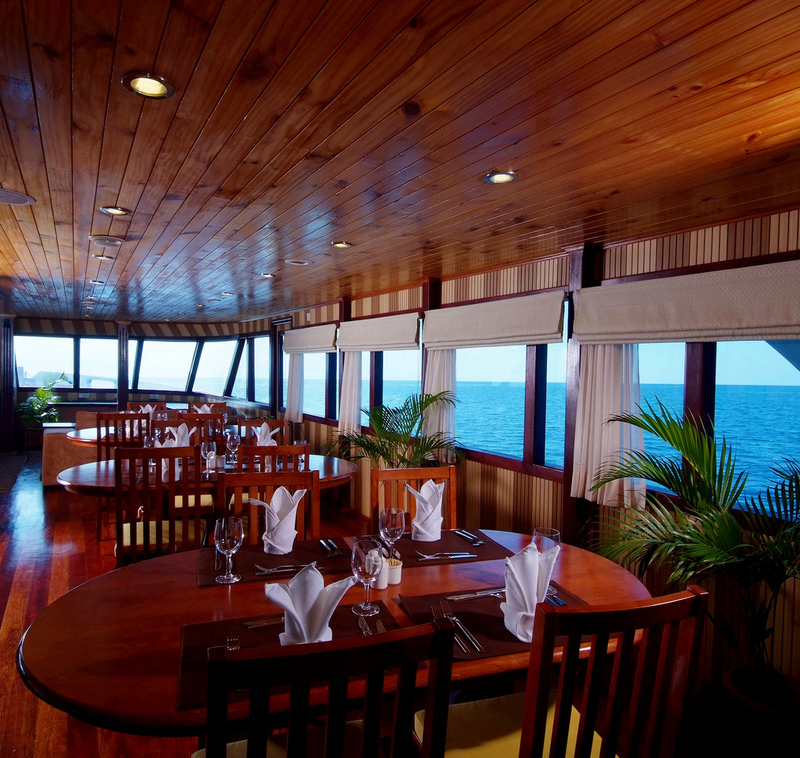 Dining is to port at 5 elegantly dressed wooden tables. 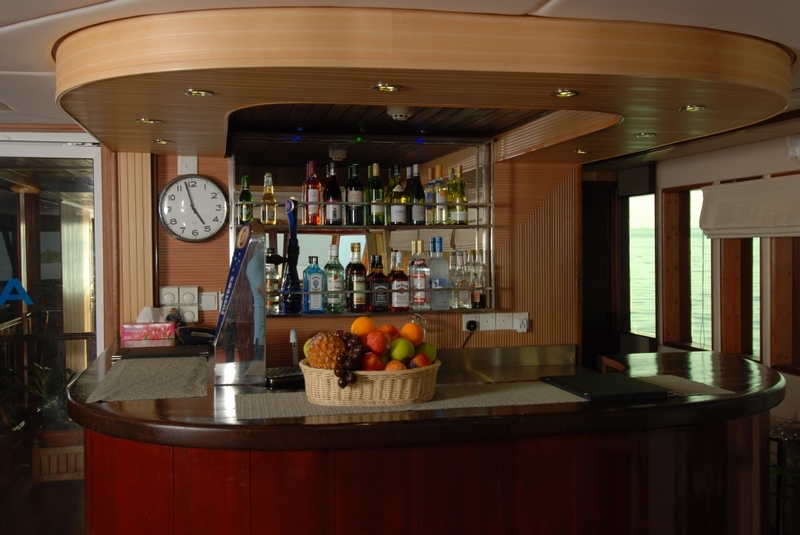 A full wet bar is aft of the salon and dining. M/Y LEO (ex ARK ROYAL) offers plenty of exterior deck space. 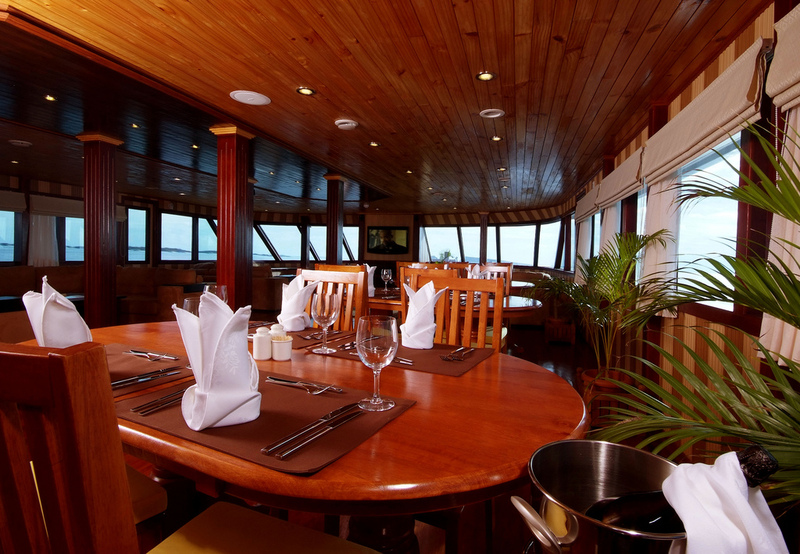 Aft the deck is dedicated to diving with areas to get suited and ready to enjoy all the Maldives have to offer. Forward an outdoor lounge area with ample seating and sunning areas is the ideal place to enjoy a cocktail or simply relax and take in the views. 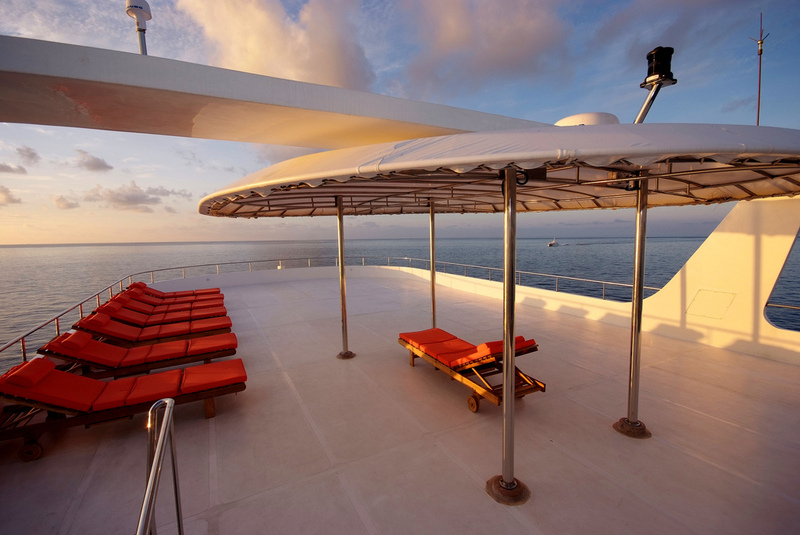 Above, the sundeck has chaise lounges and a partial Bimini for those who prefer shade. Superyacht LEO has a beam of 9.3m (31.5ft) and cruises comfortably at 12 knots powered by 2 500HP engines. 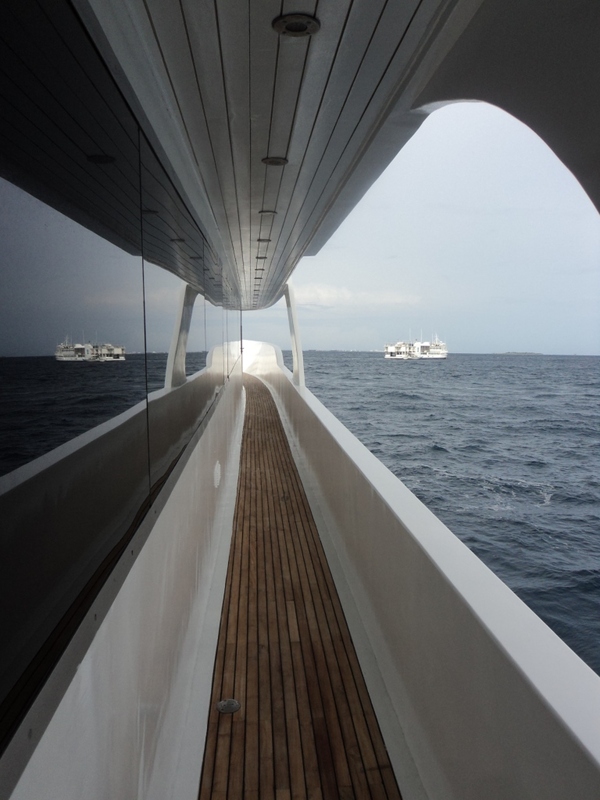 The Yacht comes accompanied by a Maldivian style 17m (55ft) Dhoni (tender) for diving plus a smaller tender. 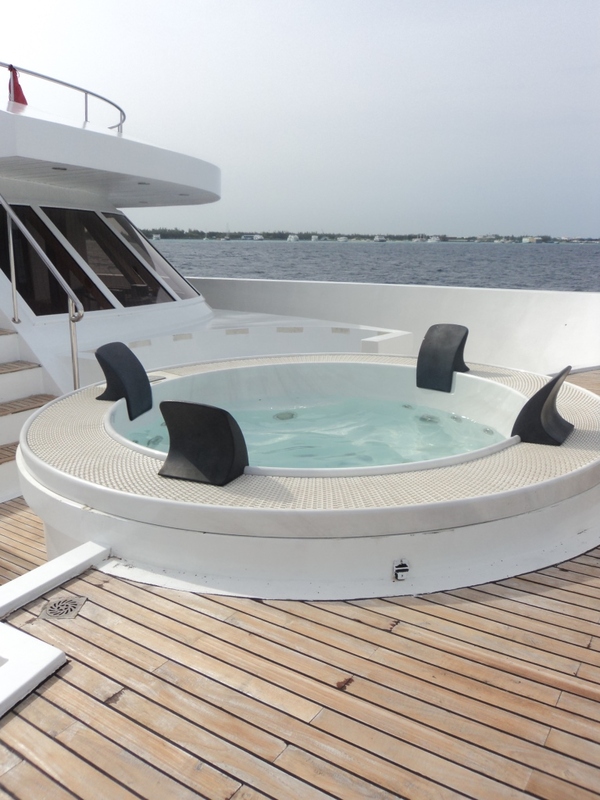 Below is a summary of inclusions and options available while chartering the motor yacht LEO. 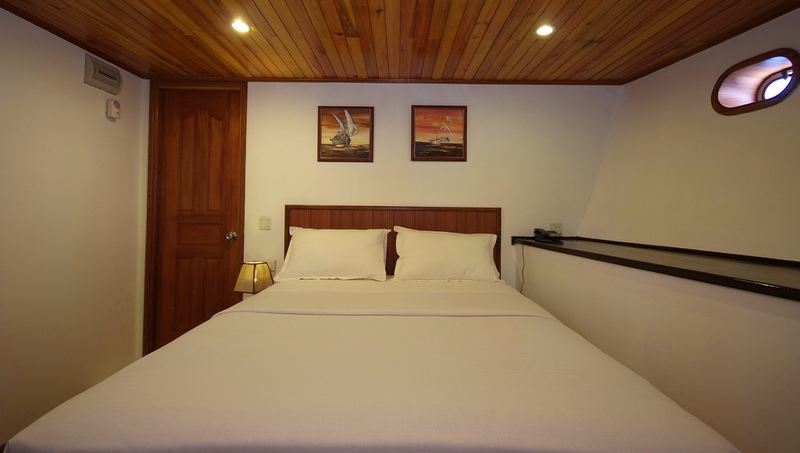 - Rates are inclusive of the Government Bed Tax of US$8 per person per day. -GST (Tourism Goods & Service Tax) of 6% (till December 2012) and 8% (from January 2013) will be charged extra. -The maximum sailing hours per days is 4 and the cruise will not sail between 17:30 hrs and 06:30hrs. -Embarkation time is 14:00hr and -Disembarkation is 10:00hrs. -Meeting Guests on arrival at Ibrahim Nasir International Airport and Airport Handling Service. -Transfer of Guests from Ibrahim Nasir International Airport and on completion of tour from Cruise to Ibrahim Nasir International Airport. 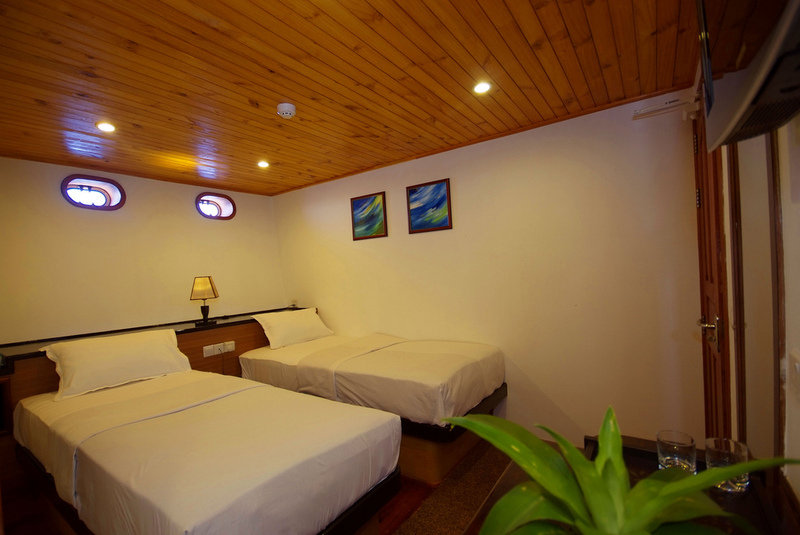 -Accommodation on the Cruise – Double or Twin sharing rooms. -Full board meal plan - Breakfast, Lunch and Dinner (Water, Tea and Coffee at meal times included). -For late night Embarkation and early morning Disembarkation, Supper and an early Breakfast will be offered onboard respectively. -The service and the use of the facilities listed under ‘Complimentary Service’ below. -All diving guests are offered a maximum of 3 dives per day, with an additional night dive per week. -Certified Divers may only participate diving and are required to show their license cards for registration. - A PADI certified English speaking Diving Instructor/ Dive Master will guide all dives. -Skipping any dives doesn’t entitle for any refunds. -For equipment, the cruise provides only the Tanks and Weights. -Additional diving equipment / accessories may be brought in by the guest or hired on rent from the diving facility of the cruise. -Surfing is not available on a standard cruise tour. Guest who wishes to surf shall request for a Surf Cruise at the time of the reservation. 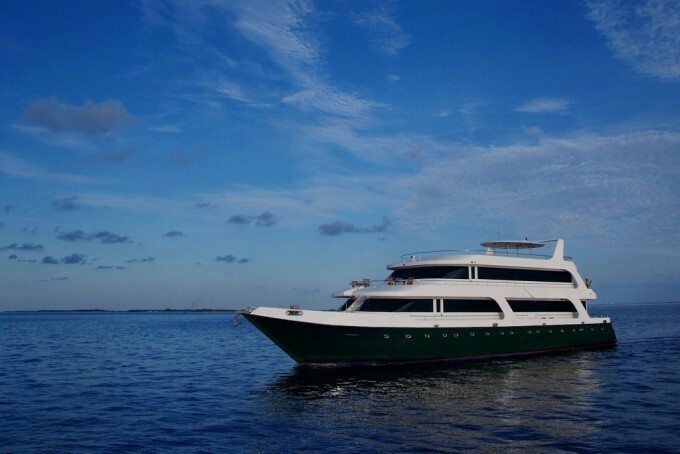 - On surfing Cruise, diving is not available, and the vessel will sail routes to Maldives’ highly renowned surf breaks and guest will be offered daily surfing opportunities. -All service and activates listed under ‘Complimentary Service’ will also be available on surf Cruise. -Guests are requested to bring their own gears for surfing. -For surf gear rental, requests shall be made at the time of the reservation. -Unlimited Sun Lounging and swimming. -Sun bathing on sand bank or Virgin Uninhabited Island. -Snorkeling (Equipment rental not included). -Diving – 3 dives a day and 1 night dive (Tank and weight provided). -Special barbecue Dinner on the beach of the sand bank or Virgin Island – once a week (if weather permitting). -Night-Fishing trip for line & weight reef fishing – once a week. -Sightseeing visit to Inhabited Rural Island – once a week. -Sightseeing visit to Capital of Maldives, Male’ – last day of the cruise tours. - Hydrotherapy corner – 6 persons Spa Spa Pool. -Music and movies library - a collection of classic and latest movies and music. -International telephone calls-IDD telephone and Facsimiles. -Spa - All Spa treatments. 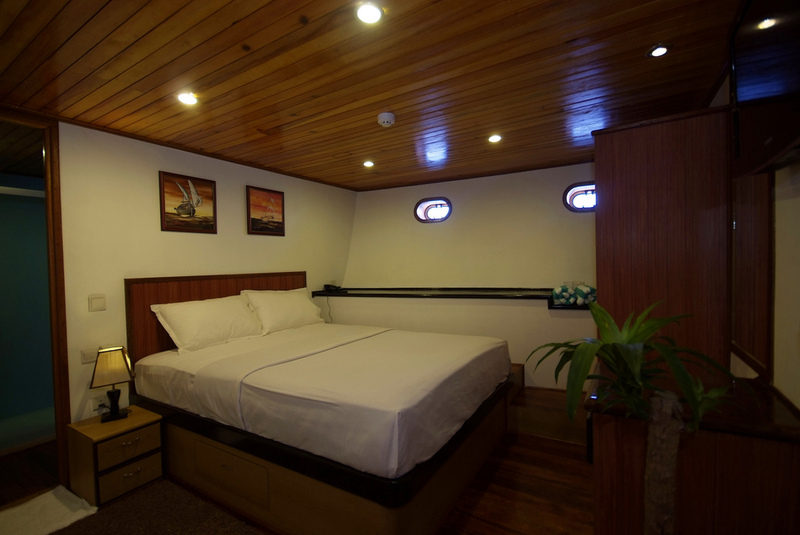 Maldives motor yacht LEO (ex ARK ROYAL) can accommodate 18 guests in 9 spacious double cabins consisting of 8 deluxe cabins and 1 suite. 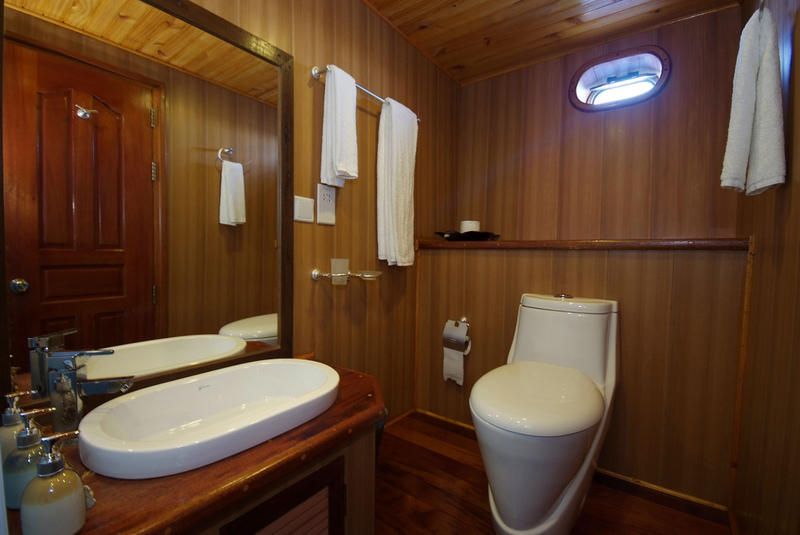 The cabins are convertible and can be configured as doubles or twins, each with private bathroom containing toilet, vanity and private climate control, LCD TV, DVD, IPOD and CD player, a private mini bar, electronic safe, telephone and Wi-Fi. In terms of cuisine the yacht LEO offers contemporary flavours from the Maldives, the East and the West prepared by onboard chefs. The finest crustaceans cooked in various aromatic styles are guaranteed to suit palates of all nationalities. All types of Beers, unlimited various wines, champagne, cocktails, spirits, mineral water and soft drinks are available. SPA: Spa treatment rooms and Steam Bath. TOYS (diving): Diving Dhoni: 55 foot dive tender. Compressor: 2 dive Compressors. Nitrox: NRC Membrane System. Weights: Weight belts and weights available free for usage. Rental equipment: Regulator complete, BCD complete, Dive Lamp, Dive Computer, Mask, Snorkel, Fins, Wetsuit, Snorkel Set, Weight and Belt.